ENGEL AUSTRIA has won another contract to supply system solutions to BMW’s Leipzig factory, where ENGEL duo injection moulding machines are used to manufacture car body shell components for the BMW i3 electric vehicle. The latest order includes two large-scale ENGEL duo machines with 40,000 kN clamping force integrated as a double system. In master/slave mode, both machines can be synchronised to injection mould and complete two components at the same time. This manufacturing principle makes sure that both components undergo exactly the same material aging process and that the high quality requirements are met. As the general contractor for the manufacturing cells, ENGEL has taken responsibility for incorporating automation into the entire system. 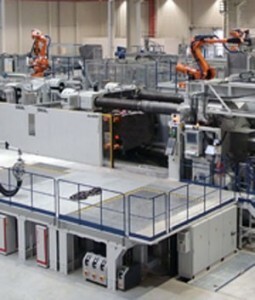 Both machines are fitted with a multi-axis robot. ENGEL delivered the first manufacturing cells of this type to Leipzig back in March 2013. ENGEL AUSTRIA is a leading supplier of lightweight solutions for the international automotive industry. At its technology centre for lightweight composites, which opened in 2012 in St Valentin, Austria, ENGEL develops new technologies and processes for the manufacture of fibre-reinforced composite material in conjunction with partner companies and universities. With its system and automation expertise, ENGEL adds an important success factor for highly efficient production concepts to the world of composites, which is still heavily dominated by manual methods.